There is almost one gigawatt of energy-saving distributed generation (DG) resources installed across New England, Synapse found in a report prepared for the E4 Group—and state policies, together with falling technology costs, could lead to the installation of nearly two more gigawatts by 2021. So why does ISO-New England currently assume that zero megawatts of new DG will be installed by 2021 for the purposes of transmission reliability planning, potentially leading ratepayers to fund unnecessary transmission upgrades? 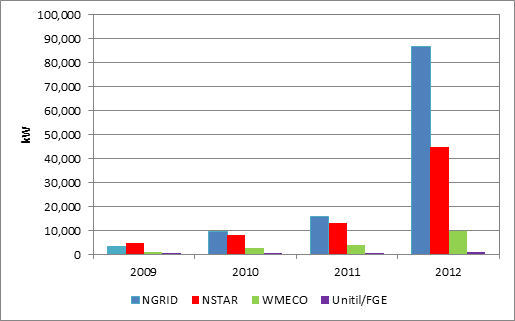 Synapse found that public policies, goals, and funding mechanisms adopted by the states—such as Renewable Portfolio Standards (RPS), the Massachusetts Green Communities Act, net metering, green purchasing, feed-in tariffs, and standard offer programs—are driving the rapid development of DG resources and solar PV in particular. Taking into consideration the plans and policies already in place across the New England states, Synapse found that over 2,855 MW of DG resources are likely to be installed by 2021. These resources reduce customer demand for energy from the grid, and can help reduce peak load levels. This should reduce the need for reliability-related investments, leading to significant savings system-wide. Synapse’s analysis suggests that ISO-New England significantly underestimated the future growth of DG resources in its recent long-term load forecast. The region already has a total of 980 MW of DG resources installed, most of which is solar PV, and the rate of installations has been increasing. However, the ISO estimated that only 800 MW of solar PV would be installed by the end of 2021. Moreover, the ISO includes only a small portion of the 800 MW of PV in its system forecast and, as noted above, none at all for the purposes of transmission planning. Based on this research, Synapse’s study recommends that the ISO establish a DG Forecast Working Group to develop a reliable forecast of DG resources that can be included in the ISO’s 2014 Regional System Plan. View Synapse’s full study, Forecasting Distributed Generation Resources in New England.